Perth was my first solo days in Australia. Getting my feet wet so to speak, getting back to the solo travel experience. Once I learned to walk on the correct side of the sidewalk navigating Perth streets became much easier. I even got brave enough to jay walk. I revelled in walking the malls and finding my way around the streets, the cultural district, Northlands. 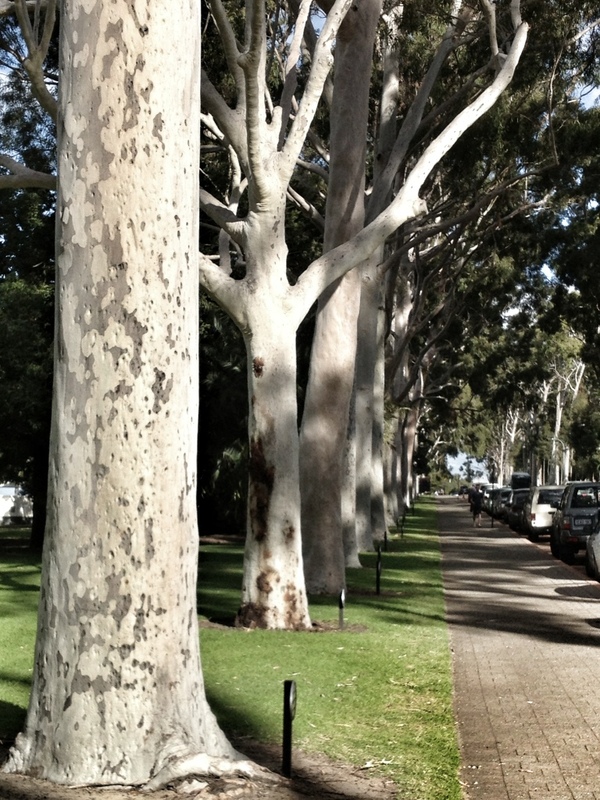 I loved the trains, Freemantle, the ghost gums in Kings Park, eerie trees, a fitting tribute to soldiers gone. I spent days in the museum and the art galleries. I liked how quickly I could find my way around. I loved it all! 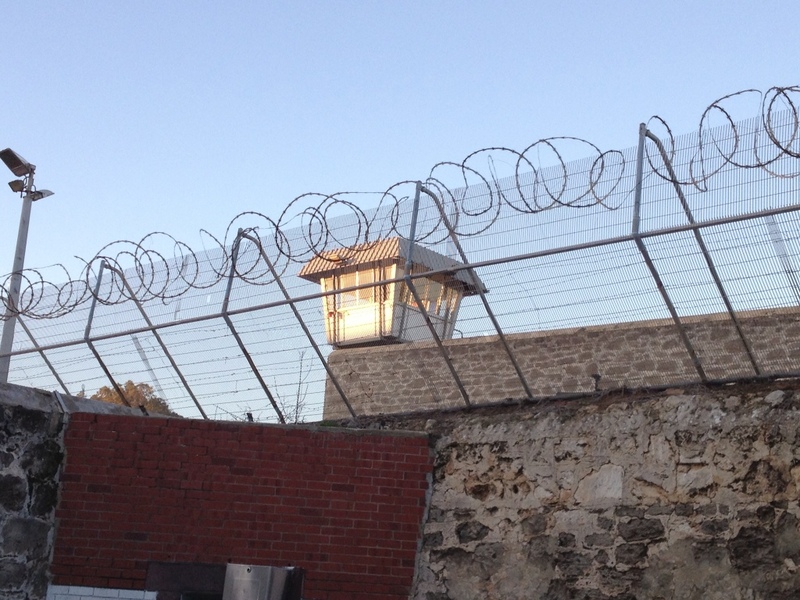 I did things I never do nor ever expected to do: tour a prison, go to a zoo. Both places caused me to assess how I felt morally and spiritually about being in these places. And the beaches! I can just imagine what a fabulous city this must be in the summer. I unfortunately was there on the coldest days of the year. And speaking of cold I was amazed that no one in Perth acknowledges the cold and no one has central heating! You might be lying in your bed with a fuzzy bathrobe wrapped around your shoulders under woolen blankets,but no need for heat. All well and good if you have another body in bed that generates heat but way too cold for this solo traveller! Some of my favourites: the art experience at PI! 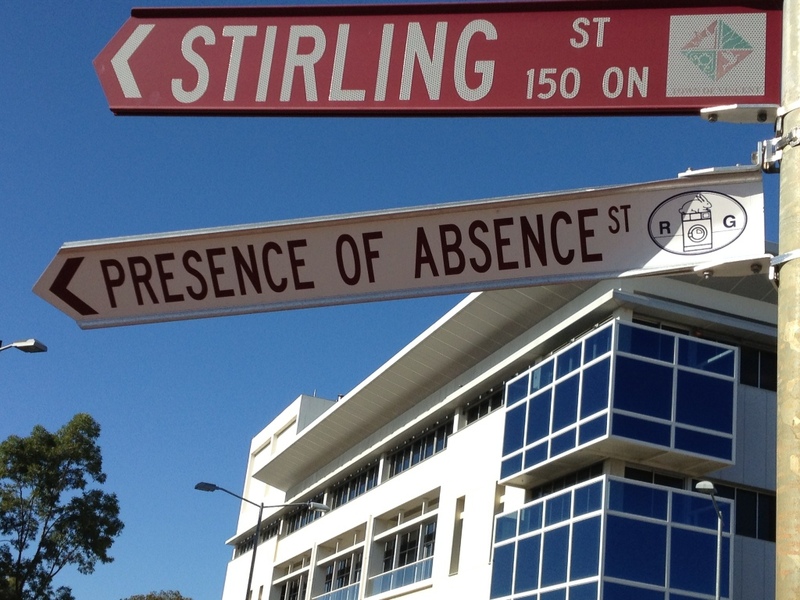 Some wonderful modern art; the Western Australia Police Pipe (make that bagpipes) Band that was playing at the pedestrian mall; winter fest and the fake snow machine; didgeridoo players on the pedestrian mall; the public art project that gave alternate names to streets – Presence of Absence and Ambivalence of Destiny streets. I laughed at the complaints about the transit system in Perth. They have trains and trams. Lots of them. Vancouver transit would be a rude awakening for people of Perth. Really, what was not to like about Perth? How’s about the cost of food? I understood expensive in Exmouth – the end of nowhere where everything must be flown in or trucked a very long way – Perth is a fifteen hour drive. So yes, I understand fish and chips for $29.00 and nice meals for $40 or gulp $44 in Exmouth. But I don’t get the costs in Perth. Dear Perth. Dear as in expensive! Imagine on a holiday Monday one of the restaurants that was open calmly saying to me “we charge a 10 percent surcharge on a holiday”. Excuse me? You want me to pay you extra money when you have quite likely had an increase in business due to the fact that not everyone is open on a holiday? Needless to say this indignant Canadian walked herself right out of there and back to my favourite dining place Old Shanghai. Old Shanghai is like a mini food court with a central eating area and about nine vendors who seem to be the same from Old Shanghai to Old Shanghai. There’s dim sum, chinese, Malaysian, east Indian, fried foods like steak or chicken, a bar with wine, beer and spirits, a fresh juice bar and a couple of others that escape me now. Reasonable prices and good food. Thank goodness. Lunch and dinner for $10-$15; great bowls of hot and sour soup, spicy noodles and wonderful fresh dim sum. Plus if you don’t finish all your meal you don’t feel as if you have just committed a crime against your pocketbook! Perth. Like this evening. In the restaurant at the casino you have to walk up to the bar to order your own drink. AND you have to go and order your own food at a different station. I’m surprised you don’t have to pick it up at a window yourself. And all of this for a $29.00 burger! Someone has sure pulled the wool over the eyes of the Perth populace if you ask me. Rumor has it that the east coast is cheaper. I certainly hope so. The best lunch I’ve had on my own was today standing on the beach at Bunbury eating rice crackers and a wonderful $5.00 fresh cheddar I bought at the cheese makers yesterday and a wonderful apple. Cheap too. Get me out of here or I will be reduced to McDonalds, the only affordable meal in town! And if I really wanted to, I am not above doing something like that. I have been known to approach strangers and ask if I can join them for dinner. It’s the prerogative of those of us who travel solo. Not belonging to the back packer generation presents its challenges also. I have sat on an airport shuttle and eavesdropped on conversations where three young people were strangers and in the space of a 20 minute bus ride, one of them is going to sublet another’s room in a shared space and all three of them are meeting up the next day. The bond of transient youths. Not quite so easy for the gray generation. Take hostels. The front desk person at The Barracks Hostel in Perth certainly seemed intent on impressing on me that on weekends the place was noisy. She kept looking me over and I could almost hear her thinking that I might cramp someone’s style. It must be the haircut. What does one do to save keep from spending all my cash on expensive Australian hotels? I turned to Airbnb. Not only did I get to save money, I met some great hosts and got to talk with people too. There’s a wide range of accommodations from shared rooms to whole houses, both short-term and long. Like booking any travel yourself, there’s a lot of time spent reading descriptions and looking at photos, trying to find neighbourhoods in unfamiliar cities on a map, reading other traveller reviews. But all that research and ultimately gut feeling and luck has been a wonderful experience. Every one of these hosts I would be happy to call a friend. Who knew? My very first selection was a room in a home in Perth. They had five rooms to let with all rooms sharing a lounge and bathroom. Luckily for me, except for the first night, I had the place to myself. One of the reasons I selected it was the great reviews about the host’s night time snacks and the proximity to transit and inexpensive eats. In these regards it was even better than expected. My great host went above and beyond. I came down with a cold and she supplied cold remedies and fresh picked limes to soothe me. And let’s just say the pick up from my hotel, the two tours around various areas of the city, and the drop off at the car rental agency were all much more than I expected. Add the homemade gluten-free muesli and the flour-less bedtime treats…I haven’t been this spoiled since I lived at home with my parents. For my second foray I chose an apartment in a trendy area of Sydney, within walking distance of transit and quite central to places I wanted to go. Hit lucky again. My host picked me up at the airport, dropped me at this fabulous two storey penthouse and disappeared for most of my stay. When he was around there was a glass or two of wine and please help myself to anything in the fridge. A very large and spacious room to call my own, and use of the modern apartment. No home cooking but it more than made up for that with the feeling of opulence, ease and comfort. The last place I chose was in Melbourne and I selected it because it was central to transit but mostly because I read about George the host’s friendly Labradoodle. I was intrigued by the thought of some dog love. Once again I had a large room with a comfy bed, a generous host and a couple of lovely evenings with some wine and hospitality. Not to mention lots of pets and cuddles with George. I think I may have hit upon the perfect way to travel! Thank you Air BnB!